I certainly believe Boston is easier than the NYC Marathon, without a shadow of a doubt. The thing is you have to be really smart, cold headed, and great at pacing to be able to race it well. You can’t just go out and go by feel. But no one does that, right? So, here is what I used to get a strategy ready! So, really, not so scary broken down, right? Well, hopefully you trained specifically for the course, which means rolling hills, up and down, up and down. People tend to focus on prepping only for the uphills and forget the dowhhills. And if you’re not prepared for all those 15 miles of down, your quads are going to be trashed very early on and you’ll suffer throughout. Just because downhill seems easier doesn’t mean they don’t have a lactic price! So, hopefully, you’re properly trained for the demands of this course. Very important note: the massive drop in the first half mile. If you start very excited and go out too fast, YOU ARE TOAST. Curb your enthusiasm. Or start a few corrals back if you can’t (at least two or three corrals). I repeat: DO NOT start too fast or you’re donzo. Ease up on the quads and take it easy on the downhills, at least for the first 5 miles. DO NOT think that you need to store up time now. Do not; there will be time for that. Remember BANK = BONK. You can speed up in the flat parts, and the subtle ups/downs but if you take these downhills as your chance to PR you WILL regret it later. Now, make sure you’re running downhill properly or it’s gonna cost you. How do you do that? Make sure you let gravity adjust your body position as get as close as possible to being perpendicular to the hill. Short steps, increase your turnover. Do not overstride, do not break, do not lean back. Stay relaxed. This is not a constant climb, so it is not as scary, there are long flat stretches where you can gain some speed. There are four climbs, the last one being Heartbreak hill. I didn’t think they were such a big deals as they made them up to be, but that might be because I was prepared for the course, and because I run NYCM every year, and because Harlem Hill exists. This was not that hard and I actually had to ask around to know I had climbed Heartbreak… I really had no clue I was done with it, I barely noticed it. So, I would NOT be scared. Can I say it again? the hills are NOT BAD AT ALL if you run a smart race. Take them easy and go wild in between. Your goal and motto should be to get to the top of Heartbreak in one piece and in good spirits, because that is when you can break lose. As a reference, in you are a NYC Runner, Harlem Hill is 0.32 long but it has a 84′ rise, with a 4.4%. As you can see, Heartbreak hill (the last of the 4) and Hill 2 resemble HH. Hill 1 and 3 are a bit less steep. You go wild. You hit the gas and run like you’ve never run before. * For overall pace, I’d recommend running Boston the same pace as your qualifying race, and then, if you have any more speed left at the end, go for it and PR. * Because most of the course is exactly on the same direction, don’t forget to apply sunscreen, mostly on your shoulders and back, and if you’re wondering if you need sunglasses, you don’t. Sun will be at your back 80% of the race. * If you still don’t have a pace bracelet, and you want one, I really like these, they’re customized to the Boston course and you can set it up based on: effort vs pace, slow start/fast start, min vs max fading, etc. * Race Day, arrive at the shuttles early, you don’t want to stress in the lines and when there is traffic. Use the portapotty before, the drive to the start can be over an hour long. * At the finish, pretend your last name starts with C or D, otherwise you’ll have to walk a lot longer to find your family/friends. * Wear your medal proudly: you’re amazing. Boston 2014 race, Sunday pictures, Saturday pictures. Good to go? Think you can hold your horses? Questions? Even though this will be my fourth Boston, I still enjoyed your overview. I’d agree with everything you said except the no sunglasses bit–I just think sunglasses make you look like a badass. Thanks! And i can’t even imagine you without sunglasses! Thanks very much. This is a great summary! omg, I’ll be burning this into your brain! Thank-you for the overview. This echos the comments I have been getting from my training group. The hardest thing for me is to hold back in the first few miles at the start. I have been told that if I do I will pass several later in the race. I will re-read you notes again leading up to my first Boston. This is exactly the advice I got last year (except the part about going for it on the flats from 16-21 — that’s a good tip). I followed it and it worked like a charm — I missed my PR by one minute. I’d add one thing: Last year at Mile 23, I said to myself what I always say at Mile 23: “Just 5K left, and you can ALWAYS do 5K!” Then I said, “Hey, wait a second… This is Boston! You’ve worked for years to get here!! Soak this in! !” And I did, and it was wonderful. So, I’d add: As you come into town, and the crowd that’s piled out of Fenway is cheering you on, and the crowd support is 3, 4, and 5 people deep, and everyone’s emotional because of what happened last year: Soak it in. Enjoy every moment of it. You’re there, you’re a part of history, you earned it, and you’ll never know if you’ll be back. I love the breakdown of the race!!! Very good and interesting!! Great stuff. But I thought there were lots of little curves and plenty of opportunity to do tangents – if the people aren’t in the way. Good luck! Not really… tiny curves that won’t make much of a difference. So at least you can focus on the pace and not the turns! Ah, I totally agree. Only I am usually thinking of races like Berlin that have 56 turns, or NYC, 28 turns… so I don’t quite consider the long curves but I guess you need to pay MORE attention as otherwise you’d miss them. Great point!!!! thannnks!!!! Doesn’t sound so bad, at least you get a lot more downhill than uphill, not only distance wise, but loss vs. gain. it isn’t bad at all. Helpful, thanks! (read an earlier post of yours before I BQ’d) Hadn’t read the idea of going out at your BQ pace (which was PR for me both in March 2014 when I qualified for this Boston – my first!!! then in Oct 2014 when I PR’d & BQ’d for 2016). I wanted to set a new (really ambitious) PR but am having to re-think that due to hills, how I’ve felt in training, life stuff. A bit scared about the downhills. I’m a treadmill runner, not many hills in the area and weather has kept me inside. I’ll try to get more in the next 4 weeks, but it’s going to be a new experience for me. Any tips on when to eat/what to eat pre-race? I usually run early AM, start on empty stomach but have tried to move long runs later to mimic Boston schedule and eat maybe half a Hammer bar a while before. So much different about Boston – up at 5, to buses by whenever, then a long drive (sitting, ugh) and a long wait outside in a field, very late start so could be warmer. I guess that’s why I’ve read you can’t really “race” Boston until you’ve run it at least once. But I’m trying to learn and visualize and practice to the extent I can, so any little tips or tricks very welcome! Running your first Boston can be tricky if you’re not 100% of how to handle the course. Do try to find downhills to prep or you’ll be sore and tired early. Maybe even try some quads eccentric workouts to do too! As for eating… you still have some time to practice on your next long run. Maybe wake up earlier, have what you’d uusually have, wait a couple of hours, and then go do your long run? I don’t eat before a marathon so whether it’s at 8 am or 11 am it’s the same. I just eat/go to sleep earlier or later the day before. I’d just have a couple of powerbars when I wake up and a gel or two 1 hour before the race to top off the tank. For me, I do NYCM every year so the logistics are pretty similar… as long as you eat and hydrate a lot the day before you shouldn’t stress much about food. And yes for “being ready”, it can be tough the first time you do Boston. I just really took it easy on the first miles and raced at the end. It worked out. Just always remember, no matter what, about that first half mile…! Excellent description and advice. This is really great for first time Boston runners. Training for the downhill is key and holding back the pace those first miles. Funny, last year I was reminding a runner next to me within first 2 miles or so when she chose to share with me that she felt great. I said very similar things as you and I hope she listened. I was lucky to be given very similar advice before my first Boston by a sweet older gentleman at a local 5k who had run 15 Bostons. I’m glad I listened. 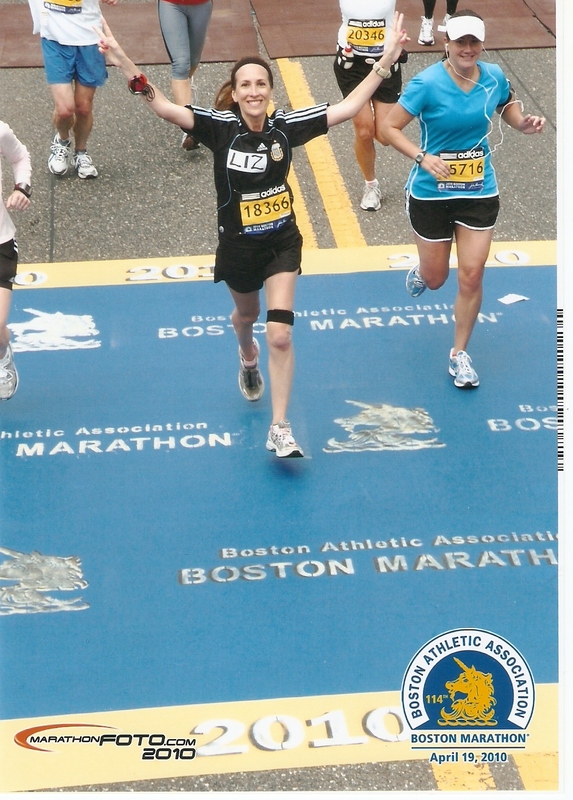 That was 2011 and I’ve been running Boston ever since and I hope to keep going back year after year! Great job again and I’m glad I found your blog. thank you!! Even though we can share our opinions, and first timers can totally believe it and have the best intention, come race day sometimes excitement takes over and you know… that first half mile…! I spent a whole year researching about Boston and, as per usual, your post was the best thing I found. You should seriously think about writing a book about NYCM and Boston. I’m serious. QUESTION: you know how much I hate the heat! I’m not a fan of sunglasses and visors when running but, at the same time, I want to be prepared. You mentioned the sun being at your back pretty much the whole time and not worrying about wearing sunglasses… do you think wearing a visor would be a good call since there’s zero shade on the course ot that will not really make a difference? Thanks! hahahaha, the book thing is hilarious and yet so meany people suggest it… this is easier!!!! YES, WAY EASIER. WAY WAY EASIER. you’ll see. Not to brag, but when I did it the first time, I had NO IDEA I had crested Heartbreak until I saw a sign, I didn’t even notice it! SERIOUSLY! I don’t think you need a visor, as the sun will be on your back the first 23 miles. it’s a side/back sun,, so if you HATE the sun, bring an old one you can toss if you think you don’t need it. I never felt like I needed it. Thanks much for this article. Being less than 7 weeks until this years race, I have been thinking about the strategy in my first Boston! Excellent advise and layes out very well. Fortunately, I have been training hard and properly for both up and down hills. I like your comment about NYC also. Makes me feel better about Boston as I did not perform my best at NYC last year, and did not train as well as I am for Boston.